Katie Smrcka-Duffy Fudd had more wisdom than she knew when she was just a teenager. A star basketball player at James Madison High School in Virginia — and later a WNBA draftee — Smrcka-Duffy read stories as a teen about Stanford's All-American basketball player Jennifer Azzi and was so impressed by Azzi's character that she vowed when she had a daughter, she'd name her Azzi. 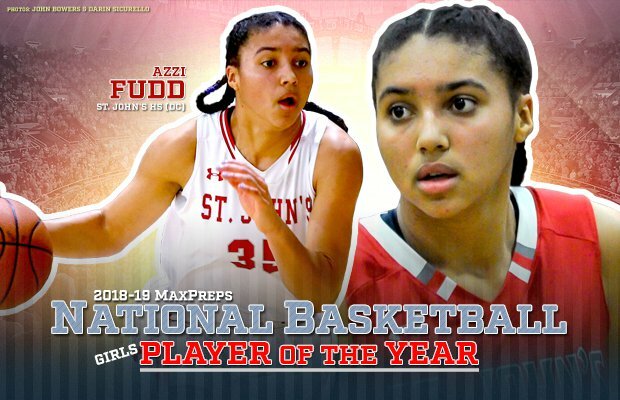 As it turned out, the name was perfect for that daughter, Azzi Fudd of St. John's (Washington, D.C.) , who has become the first sophomore ever named as MaxPreps Girls Basketball Player of the Year. See the St. John's standout leading the Cadets to a No. 2 ranking. Fudd earned that honor by leading St. John's to the No. 2 ranking in the country with her Azzi-like combination of all-around skills. The 5-10 guard can shoot threes, finish at the rim and, as rare as a Chinese philosopher with a killer crossover, has a deadly pull-up jumper. "She's just a silent assassin," says her coach Jonathan Scribner. "She's not demonstrative — she just methodically destroys you." And Scribner is quick to point out that Azzi's contributions go well beyond her 26.3 points a game. "She's the best defender in the country," he says. "Ashley Owusu (on the MaxPreps' All-American list) is the only player in two years who scored her average when Azzi was the defender." It's not surprising, though, that Fudd has a complete game, as both parents were exceptional players. Dad Tim played at American University before an overseas professional career, and mom Katie began her college career at North Carolina State before transferring to Georgetown. And it didn't take long before Azzi began showing that the apple didn't fall far from the tree. "We went to the fifth grade AAU nationals when Azzi was in third grade – and she was doing things the older kids couldn't do," says Katie, "and having so much fun." "I've always played two years up," says Azzi, which is why graduating teammates Carly Rivera and Malu Tshitenge-Mutumbo have played with her since elementary school. Next year, however, they won't, and Fudd will lose a big part of her basketball comfort zone. "It's weird not having Carly and Malu at AAU practices," she says, but even with them, she's been the focus of opposing defenses. "There's always going to be people coming after me," she says, just as they did to Jennifer Azzi when she was in high school in Tennessee, in college at Stanford, in the pros in the ABL and WNBA, and on the Olympic team. "I had a jersey of hers, but I never really knew who she was," says Azzi. "Now I've built my own name around it." And it's a name basketball fans would be wise to remember.